I feel like I am always going on about how rubbish my natural brows are but they really are! 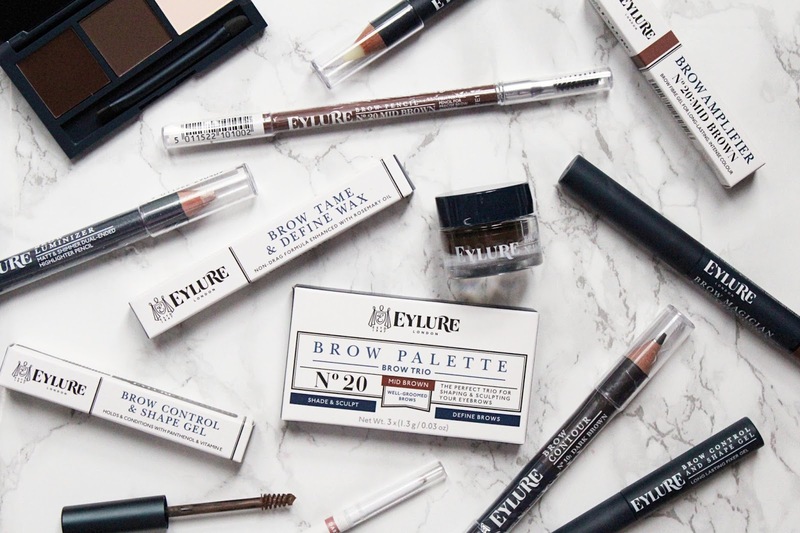 I have tried so many different brow products from so many brands, from affordable options to stupid expensive and I always come back to Eylure. One of these products is absolute holy grail status and with many that are must-haves. If I have tinted my brows, I will only need a little bit of powder to help define the brows, especially at the front of my brows and I like to use the Brow Palette (Brow Trio) in Mid Brown. This comes with a brow wax, powder and highlight shade and this is great for when my brows don't need too much help. These are extremely pigmented so a little goes a long way and I like to use the wax first and then top it up with the powder. I like to then set my brows with the Brow Amplifier in No.20 Mid Brown. This is a brow fibre gel so it will not only add colour to my brows but it will also add some volume and make my brows appear thicker than they actually are. I have been using this for over a year now and I do really love it. The brush is a great size so I never have to worry about getting any excess onto the skin around my brows. If I do need to create an arch, I will use either the Fleur de Force Brow Definer or the Brow Contour. I raved about the Fleur de Force Brow Definers recently (you can read my full review here) and the Brow Contour is a similar product. Both of these are brow pencils/crayons which I like to use my create my arch because I have slightly more control and I find them to be longer-lasting. The Brow Contour comes with a brow colour and highlight whereas the Brow Definer comes with two shades of brow crayon. Both are very pigmented and work brilliantly, I like to use the Brow Contour when I have a little more time to do my brows and the Brow Definer for when I am in a hurry. I can use this to completely do my brows if I want too and I love that it comes with a lighter tone as it's great for the front of the brows so they don't start off looking too intense. I am obsessed with the highlight end from the Brow Contour, it is incredibly creamy, making it so easy to apply, and it helps neaten up the brows after I have finished them. If I am going to stay the night somewhere and I am limited on space in my makeup bag I will always take the Brow Magician as this is a one-stop shop when it comes to brows. It comes with triangular shaped crayon which I use to fill in my brows with the thicker end and with the pointy end I will use that to create an arch. On the other end of the product is a tinted gel to lock the brows into place. This has a really thin brush that makes it so easy to comb through the brows without going outside of the brows. I love to then highlight my brow bone with the Brow Luminizer Highlighting Pencil. This comes with a matte and shimmer brow highlight and I love both shades, I have even used them as inner corner highlighters and they work gorgeously for this too! I really like to use a highlighting pencil at the moment as you can be really precise with placement and you are able to get right under the brow for the best results. These are very creamy (like every product from Eylure) and last all day long. My brows aren't often unruly but the front of my brows can be every now and again which is wear the Brow Tame & Define Wax comes in. This is such a handy product to keep on hand, especially throughout the day when I notice a brow hair out of place! All you have to do is lightly swipe this through the brows and the hairs are instantly tamed and look sleek while staying in place. It is very smooth to apply and doesn't tug on the skin. If I don't want to use a tinted gel to set my brows I like to use the Brow Control & Shape Gel. This will not only help keep my brows in place throughout the day but I find it works well to help blend any tinted products I have used beforehand to look a little more natural. It doesn't leave my brows feeling crispy or crunchy which I love. And saving for the best for last is the Brow Pomade. This is has been every day essential for the last year and a half and it honestly transforms my brows. I have tiny brows and this allows me to fill in, extend and create an arch with ease and the best part? It doesn't budge throughout the day! I can do my full brows with this if I need to but I do like to use other products with it like a brow crayon. I know everybody raves about the ABH version but I have tried it and it doesn't even compare to this. It's very creamy to apply but it doesn't move around on the skin at all, I can apply this at 5am and gone midnight, it still looks perfect. 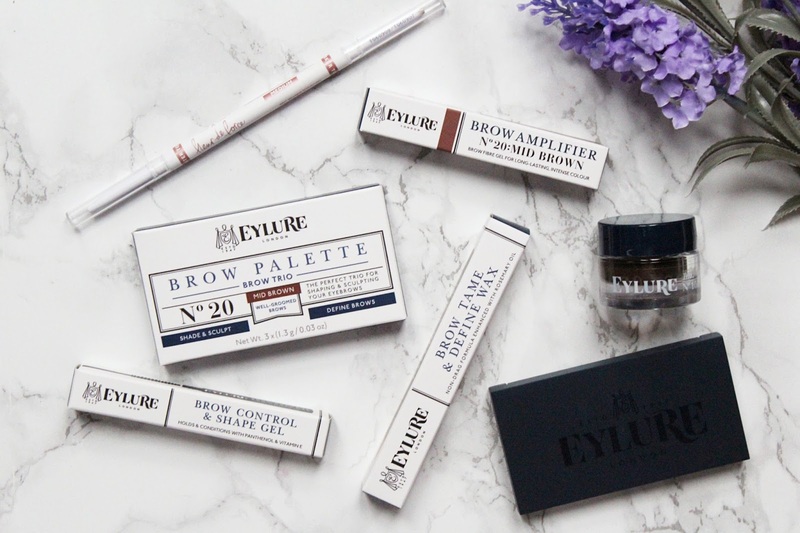 You can find the full Eylure range - HERE.